The Coyote Mountains are a fish hook shaped mountain range, and they make up 40% of this BLM-managed wilderness area located south of Anza Borrego Desert State Park in Imperial County, California. Part of the Carrizo Badlands lie within the northern portion of the wilderness, their narrow and twisting gullies giving the landscape its austere, forbidding appearance. Motorized vehicles are not permitted within the wilderness boundaries. 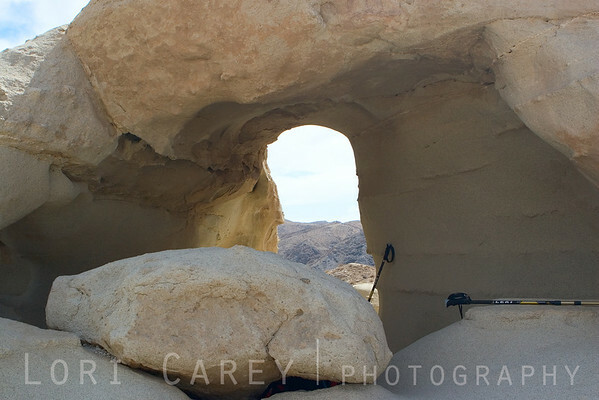 A group of unusual sandstone rock formations/wind caves, believed to be six million years old and known to locals as Domelands was our destination on this hike. The area is also extremely rich with marine fossils, including sand dollars. This is the world renown Imperial Formation, and collecting is prohibited. Despite the regulations and remoteness of the area, vandals have done enough damage in past that the area has been declared an "Area of Critical Environmental Concern". The rare barefoot gecko is known to make its home among the mountain ridges, and the endangered Peninsular Bighorn sheep live here. The BLM rates this hike as an 8 on a scale of 10 (with 10 being the most strenuous) due to the steepness of the trail and the elevation gain. Another shot of the interior. The "door" on the far side opens to a "balcony" with a wonderful view of the mountains and more windcaves.